I’ve tried creating several activity trays but since they hardly held his attention, I had to think a little… bigger. 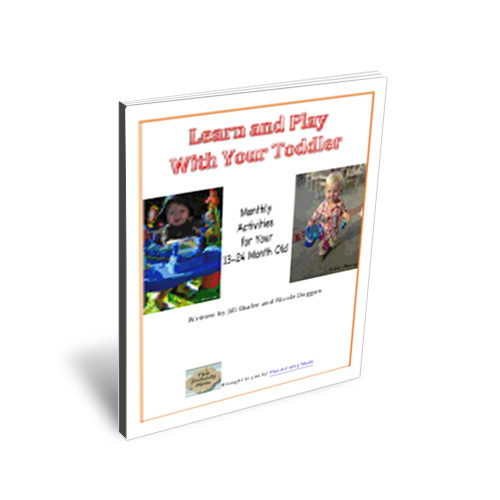 Do you have an active tot? Here’s how we’re learning with G this month! G loves, loves, loves a good basket of books. I keep a wire basket filled with tons of soft books and he’s always amazed by the flaps or different textures. 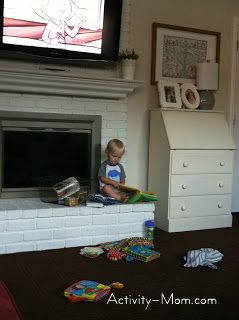 He likes to drag the basket up to the fireplace hearth, climb on up, and read. Daily! G is amazed by things that require his actions to make it work. 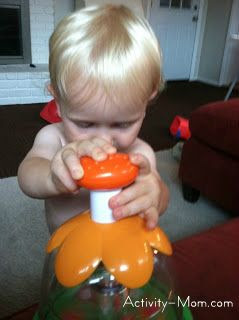 You can really see him trying to figure out the mechanics of things! Some of our favorite toys are the Chicco ball popper, the Fisher Price Incrediblock, and this SUPER fun shake and go Fisher Price Race Car. Okay, stick with me here. Since G had NO interest in any of the fine motor trays I set up for him, I switched gears and added in food. The boy LOVES food! I used a melon baller and scooped out cantaloupe, watermelon, and honeydew. Then, I gave him a plastic pick (like THESE, commonly used in bento boxes) and showed him how to skewer a piece of fruit and transfer it to his mouth. I’ve got to say, he LOVED this activity (and it filled his belly, too!). We’ve also tried using picks to eat small pieces of cut up cheese or hot dog pieces. 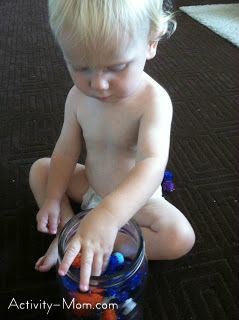 Great fine motor activity! 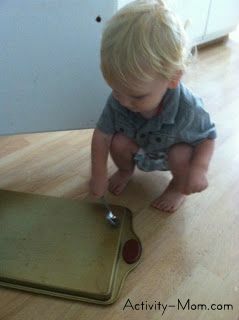 Let them unload your pots and pans (or in my case, the baking cupboard), hand them a spoon, and let them play. 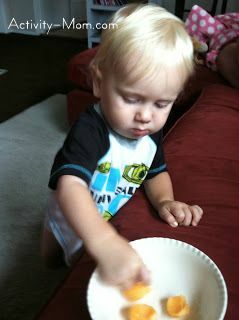 G loves anything loud so banging on pans, muffin tins, and cake molds was just too fun! This month, I introduced G to a ball of play dough. 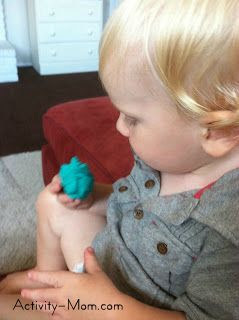 I showed him to squeeze or pull pieces, but honestly, he was more interested in using it as a ball and throwing it. We’ll keep trying! I filled a canister with pompoms of all different sizes and textures (sparkly, spikey, smooth). I always pick up packs of pompoms whenever I’m at a dollar store or dollar spot. Again, he kept calling them “balls” and throwing them, but it’s still a good intro to different types of textures and colors. He enjoyed just taking them out, throwing them, and then putting them back in. 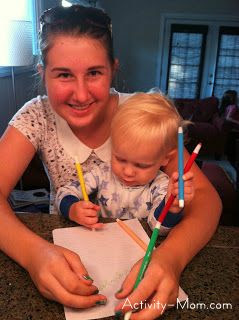 The boy LOVES to color. I like to use THESE crayons (they’re in a plastic shell) because there’s nothing for him to really nibble on, should he get an inkling to taste anything! 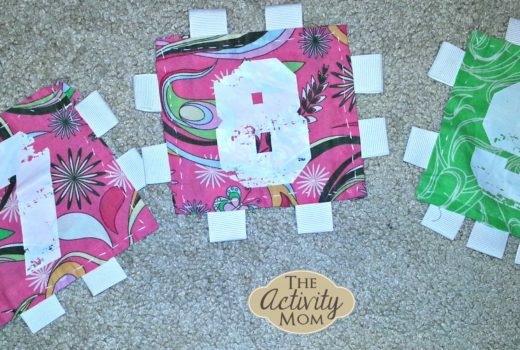 My sister was around this particular session to help out and make sure that only the paper caught the color; not the tile! How does your little one like to learn and explore? Great list! 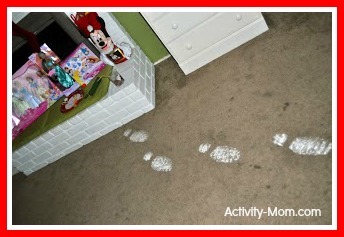 I would love if you would link this up at my link party Mom’s Library! Hope to see you there.